It’s important not to live your life by others, live it by what you believe is right for you. Plenty of people will try to tell you what job you should be doing and how you should live your life. From now on, you must take control. Emotional needs – Upset, angry, depressed and want to feel better. Solution, see a counsellor or talk to family and friends. Personal needs – Raise your self-confidence. Solution, join a support group, try new things, buy new clothes. Professional needs – Need up-to-date skills for jobs. Solution, take a course to update skills, get work experience. Financial needs – No income. Solution, get benefits sorted and set a budget for shopping. Practical needs – To make job searches as quick and easy as possible. Solution, turn a room into an office for job hunting and visit http://www.beatredundancyblues.com and http://www.beatredundancyblues.co.uk to get access to Job Sites, Recruitment Sites and Courses Sites from within the one site. After you have ticked off each achievement, you still need to acknowledge these successes in your diary. If you do this as positive reinforcement, your subconscious will realise the progress you are making and it will be more motivated to take conscious action. I am pleased to announce that beatredundancyblues.co.uk is now officially launched. 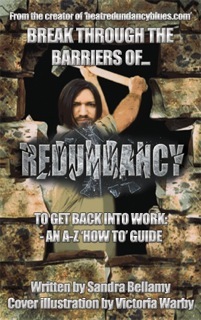 beatredundancyblues.co.uk is very similar in content to beatredundancyblues.com with access to Job Sites, Recruitment Sites and Courses Sites, from within the one site. The difference with the .co.uk version, is there is much more opportunity for interaction with you. Let me know what you like about the site and any further help and support you need through your comments and feedback. As you may be aware from my last post, I recently went to London on Monday 15th of July to meet Her Majesty the Queen and I had the opportunity to speak to her. You can read the full story on my writing blog at http://www.quirkybooks.wordpress.com This was for the CSV 50th Jubilee Celebration. I started working as a Health Buddy for Community Service Volunteers whilst being unemployed and look at where it has led to. I know redundancy can be difficult and if anyone had said to me when I was first made redundant, that I would be meeting and speaking with HM the Queen in a few years time, I would have laughed and not believed them. When I was made redundant for the second time, my attitude towards what is possible in life, began to change and now I believe that anything is possible. The more I believe that, the more impossibles do become possible. It all starts with baby steps of stretching yourself, your knowledge and your experience. My Grandma says there is no such word as can’t and if you don’t believe there to be, then that is true. Start believing that your dreams can become a reality and then take steps to make it happen. Hi everyone, whilst it’s important to get a job, choose any job and you may regret it. In order to move your life forward and put your happiness first, aim to get a job that you enjoy, love and are enthusiastic about. It will make a world of difference to your outlook on life and to your wellbeing. Take time to think about your job options before applying for any. Read more about job choices in this post from motivating daily.com. My job often requires being up pretty early or working pretty late. While this fact can be tiresome, I always look forward to new tasks and am generally more fit on work mornings, because I am grateful for my job and like the work I do, a lot. Find a job that you do with passion and enthusiasm, a job that motivates you to get up early, work hard, work long hours and generally put a lot of good effort into, and you have made great progress on your path to happiness. I am mega busy at the moment creating my beatredundancyblues.co.uk website, it will be very similar to beatredundancyblues.com with all of your favourite information pages but with a blog added for much more interaction with you. This way you can let me know what you like and what you don’t and what other help and support you need in your quest to find employment. This website is designed to give you easy access to a wealth of knowledge, experience and skills needed to survive redundancy and get back into work. No longer do you have to trawl through website after website trying to find the information you want, you can get it all here at the click of a button. Make your job search easier by getting instant access to these sites at the click of a button. Find an area that interests you and get right to it. I have to say that using WordPress.org compared to the .com version has been far more challenging than I thought it would be. What experience have you had with the .org version compared to the .com? Have you got any advice or hints and tips on how to get the best out of using the .org version? On thursday this week, I am going to an awards ceremony by the police to be awarded a Good Citizens Award. I feel honoured and humbled to be getting the award and thought I would let you know. Whilst redundant, it is great to manage your money wisely. If you want to spend some of your redundancy pay but are unsure what to spend it on, investing in yourself can be the best thing that you can do, as you are your own best asset. This in turn should help you to target what to spend your money on, as an investment for your future, rather than spend money randomly on something that may not help you. If you are worried about spending any of your money, it is your choice and one of the things that you can control in your life at the moment, whilst other aspects of your life may seem out of control. The post is entitled The Mindful Money Audit. Although I personally believe in saving money. I also strongly believe that I need to invest in myself and my future. These days I spend more money on my education and learning because I know it will help me to make more money in the future. If you are thinking of setting up your own business, you may want to attend The Business Show in London: http://www.greatbritishbusinessshow.co.uk/seminars/ on the 6th and 7th of June 2013. I will be attending and even though it is an event that I hadn’t planned for and therefore will be spending money that I hadn’t budgeted for, I think it will be worth the investment. This is because I believe I am worth investing in and so should you believe you are worth investing in too. Believe in yourself and your own self-improvement and then others will believe in you and that includes potential employers or customers. For those of you who don’t know, I have a Facebook page to support this blog and one of my followers of this page has written a beautiful account of his journey back into work. Thanks to Matthew Evans for posting this, it gives great insight and hope to many others. I wish you much success with your artwork and let us know how you get on.